Sound Performance of the stock DAC 2.6 is "solid but unsatisfying." But "the fully upgraded DAC 2.6 crosses that imaginary line into the long-term-listening-pleasure zone," sounding "more soulful, more refined and more pleasant." 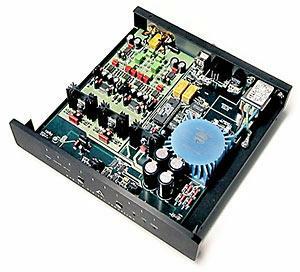 Features Burr-Brown 1704 24-bit DACs; S/PDIF BNC, AES/EBU and TosLink inputs; regulated power supplies; front-panel polarity switch; IEC power-cord receptacle; 88.2 or 96kHz sampling rates; various upgrades available. Use Signature parts kit was impossible for Doug to install, but TPC claims it's now much easier; all three kits are recommended to get the very most out of the DAC 2.6. Value Stock version, at its low price, is not nearly as involving as the "full-boat" DAC 2.6 -- at a higher price, of course. The Assemblage DAC 2.6 is the lower-cost DAC in the Assemblage product line, which includes the $1499 DAC 3.0. The standard DAC 2.6 retails for $699 as a kit. It is quite simple to assemble, requiring only the installation of the IEC power-cord socket, analog output RCAs and a few other minor items, as well as assembly of the case. For those who dont want to attempt even this simple of a kit, the DAC 2.6 is available assembled for $749. Significant features include: Burr-Brown 1704 true 24-bit DACs (as opposed to 1-bit DACs claiming "24-bit resolution"); S/PDIF BNC with RCA adapter, AES/EBU via XLR, and TosLink digital inputs; single-ended analog outputs; a small one-box chassis with thick faceplate and textured finish on the top and sides; separate power-supply printed circuit board; regulated power supplies; front-panel polarity switch; input selector switch; IEC power-cord receptacle; 88.2 or 96kHz sampling rates; and PMD HDCD filter. The Assemblage/Parts Connection upgrade kits available for the DAC 2.6 are intended to extend the performance of the DAC 2.6 without being terribly expensive. The $50 DF 1704 24/96 filter upgrade replaces the stock HDCD chip. The $50 Turbo op-amp upgrade replaces the stock op-amps in the output stages of each channel (four op-amps total). The $159 Signature parts kit provides higher-grade parts to replace some of the stock items in the voltage-regulator circuits and in the analog output stage of each audio channel. Assemblage is the third division of the Sonic Frontiers and The Parts Connection triumvirate. But dont go to your local hi-fi emporium looking for Assemblage products; they are sold direct only through The Parts Connection catalog or online at the Sonic Frontiers website. I sped through the evaluation of the stock DAC 2.6 primarily because I didnt find the sound quality all that compelling. It's not that it was bad -- its transparency and low coloration were commendable -- but the DAC 2.6 did not induce much longing to hear music. It sounded very different from the stock or modified MSB Link DAC. The stock Link DAC was not as transparent or dynamic, but it had a sense of musicality that the stock DAC 2.6 lacked. The modified Link DAC (Channel Island mods and Monolithic power supply) can be had for about the same price as the stock DAC 2.6. The Link mods improve transparency and dynamics of the stock Link enough that there is no large difference between the stock DAC 2.6 and the modded Link in those areas. But the modded Link has a harmonically rich and soulful sound that made a large difference in drawing me into listening sessions. The positive characteristics of the stock DAC 2.6 werent quite enough to get me excited about listening to music. Moving right along -- upgrades! I installed the DF1704 24/96 filter upgrade first. To do this, you remove the existing HDCD filter integrated circuit (IC) from its socket. You then install the replacement 24/96 filter in the same socket. The space around this socketed (not soldered) IC is a bit limited for prying it up with a small screwdriver, so you might wish you had an IC puller. Almost anyone should be able swap the HDCD filter with the 24/96 filter without help, especially if you use an IC puller. The HDCD filter is the largest chip in the DAC 2.6 and is easy to find. Total time to complete this mod? Less than 15 minutes for someone with minimal skills and under five minutes for someone who knows what he's doing. Sitting down to have a listen after installing the 24/96 filter proved to be a much more rewarding experience. The sound was fuller and had a human feel to it that was missing from the previous too-sterile presentation. A previously unnoticed gray quality to the sound of the stock DAC 2.6 was also removed by the 24/96 filter upgrade. Listening to familiar CDs was fun again. It should be pointed out that over the years, reviewers have been trying to tell us that the HDCD filter is one of the best-sounding filters you can use for CD playback. That may have been true a while back, but the DF 1704 filter change here indicates that 24/96 filtering sounds significantly better than 16/44.1-based filtering, even HDCD. The HDCD filter is revealed to contribute a dry, gray, thinness to the sound that would have many (most?) audiophiles complaining about how digital sound just isnt satisfying. The 24/96 filter is demonstrably better-sounding on every CD, including HDCDs. If this were my DAC, theres no way Id want to live with it without the 24/96 filter upgrade. The DF1704 filter is a great $50 investment. The 24/96 filter reveals nuances in content of the music that makes the individual sounds more refined, as though they are coming from more expensive front-end components. Cymbals shimmer and have that smooth, natural-sounding detail to them that you get with better digital hardware. Guitar and harp reveal more detail in both the initial pluck and in the sustain. Horns no longer make your jaw clench and take on a natural projection. Everything with significant top-end energy comes out sounding more refined and detailed at the same time. The added detail is not forced, and the sense of ease and air in the top end definitely cross the threshold into true high-end sound. Well, I dont know about it being "Turbo," but the replacement Burr-Brown op-amps just flat kick the pins off the stock op-amps. The sound takes on another meaningful measure of harmonic richness and is fleshed out even more. In addition, transparency notches up just a little, dynamics seem no louder or softer bottom to top, but there is better dynamic contrast. Detail and apparent speed of transients are nicely enhanced. Throw these improvements together with the 24/96 filter and the DAC 2.6 is boogie-ing very nicely indeed. Listening with both the Turbo op-amp upgrade and the DF1704 filter upgrade installed, I find that the soundstage is more enveloping and the music becomes more of a real organic entity than a sterile reproduction. This is getting to the heart of the matter in high-end audio -- the difference between reproducing music with technical accuracy versus reproducing music with the heart, soul and beauty intact. The $50 cost of the Turbo op-amps is, again, money very well spent if you own or are considering the DAC 2.6. Installation time for this parts change is also very short. The op-amps in question are small eight-pin integrated circuits in sockets, so there is no soldering required. Again, you should use care to avoid static discharges when handling these parts. The Signature parts kit is the most demanding of the upgrade options to install -- by far. You need very good soldering skills and a general knowledge of component identification, removal and installation. The Signature parts kit is not for novices. You should practice with other electronic projects before attempting this one. For someone who has modest experience, theres nothing in the Signature parts kit thats particularly difficult provided you get one of the newly laid out printed circuit boards. Assemblage makes kit building and upgrade-parts installation an impossible-to-fail process. If you screw up and the DAC 2.6 doesnt work when you get done with it, Assemblage will help you determine whether it is fixable by you or whether it needs to go back for repairs. If repairs are needed, you dont have to pay! More on this later. Installing the Signature parts kit is a lot more work than initially building the DAC 2.6 from a kit. You have to remove a fair number of parts and then install their replacements. To do this, you have to clean solder out of the holes in the PCB, and you definitely need to use caution so that the PCB is not harmed in any way. With 35+ years of occasional to frequent soldering experience behind me, I set off to install the Signature parts kit -- and I failed miserably. I was pulling minuscule solder pads off the PCB with alarming regularity. I was having extraordinary difficulty removing existing parts, and when I did get them off the PCB, cleaning out the holes seemed like the hardest soldering task Id ever been faced with. Even with my array of different irons, from 20 watts to 100 watts, nothing seemed to go well. Low-powered irons saved the solder pads but never got leads hot enough to melt the solder in the center of the holes. Hotter irons would lift solder pads like tee-shirt transfers. With a mid-powered iron, there were still some problems with pads falling off and some problems getting the leads hot all the way though the circuit board. This is the first soldering project at which I failed, and I felt disgusted with my lame self. Chris Johnson of Sonic Frontiers, Parts Connection and Assemblage did his best to cheer me up. "These first boards we had made are hell for kit builders because they have four layers and the solder pads and holes came out too small to be dealt with by most people. On top of that, two of the layers are ground planes, which act like heat sinks, making it really hard to melt the solder down the length of the component leads. Our next run of boards will be re-laid out to make installing the parts kit a breeze. Larger solder pads and larger holes will assist with heat conduction. We think most people wont have many problems with the second run." OK, fine, but my ego is still indelibly scarred from my failure. Off to the repair depot, and within a couple of weeks the repaired DAC 2.6 is back and fully functional -- and even has the same PCB I thought Id permanently whacked with my feeble attempts at soldering. Two more times Chris Johnson tried to assuage my feelings of solder failure with statements like, "Not many people are completing the parts upgrade on the DAC 2.6 for the same reasons you couldnt. It isnt your fault, its that first run of boards." Yeah, OK, whatever you say. My grief over my obviously failing soldering skills faded over the next few days, and I began to hear the fruits of my (mostly wasted) labor. was sailing the sonic seas, cutting through 40-foot sonic breakers, pounding though the chop, and racing over the smooth patches at top speed. Holy sonic euphoria, Bitman! This is now one fine-sounding DAC! Can it be the same promising but ultimately disappointing DAC 2.6 I started out with? Loudspeakers  Vandersteen 3A Signature with two Vandersteen 2Wq subwoofers. Amplifiers  Belles 150A Hot Rod. Preamplifier  Audible Illusions Modulus 3A with Gold phono boards. Analog  Roksan Xerxes turntable, SME V tonearm rewired with Nordost Moon Glo cable, low-output Cardas Heart cartridge. Digital  Pioneer DV-525 DVD player. Interconnects  Magnan Signature, Nordost Quattro Fil, Nirvana SL. Speaker cables  JPS Labs NC Series, Magnan Signature. Power cords  VansEvers Pandora and Pandora Photon; JPS Labs Analog, Digital, and Power AC cords; Audio Power Industries Power Link 313; Magnan Signature. Power conditioners  VansEvers Model 85, Unlimiter, jr. Video, jr. Analog, Reference Balanced 5; Magnan Signature; PS Audio P300. Room acoustic treatments  Michael Green Audio and Video Designs Pressure Zone Controllers, Argent RoomLens, VansEvers Spatial Lens and Window system. Well, as it turns out, yes. The full-boat 2.6 reminds me of the overweight girl or guy who disappears from your radar for a year then reappears in a newly fit, "git down tonight" body. You stare, you blink, you scratch your head; its kinda sorta the same person, but way different. Early on in the listening to the full-boat DAC 2.6, I thought to myself: This is a DAC I could live with for a good long time if I were a civilian audiophile again. That feeling lasted for the rest of the review period. The fully upgraded DAC 2.6 crosses that imaginary line into the long-term-listening-pleasure zone. Specifically, everything is more soulful, more refined and more pleasant. All of the improvements bring not the slightest reservation. Sibilants don't get harsh, highs aren't revealed to be etched, nothing unpleasant is uncovered. The Signature parts kit is a veil remover and refinement master. You get a clearer window into the performance, and every sound is more focused and complete. All instruments and voices become purer and more evocative at the same time. Slam the door of a Kia and a BMW and they both sound like car doors slamming. Yet the BMW slam is obviously more refined. Thats what we have here. Clarinets glide from note to note with better definition in the sound of the reed and body, strings lose rasp and gain rich, pure tone with a less truncated decay. Delicate resonances are more apparent in cymbals and snares, and brass instruments smooth out but remain scarily dynamic. Yes, the Signature parts kit makes a very worthwhile contribution to the general proceedings. No catch really. If your budget requires a DAC in this price range, youll find the full-boat DAC 2.6 will be a satisfying product to own. In the DAC 2.6 you get technical excellence combined with an uncolored window on the musical performance. OK, that said, the DAC 2.6 isnt totally perfect. Although it doesnt have much of a personality sound-wise, it could be even more transparent, have even better bass, and have a little more dynamic impact. There could even be just a touch more soul in the performance. But you wont ever notice these shortcomings unless you compare the DAC 2.6 directly to some other DAC that does those things better. The wishes on the wish list are not weaknesses -- they are merely performance parameters that arent the best you can get. But for around $1000, the kit or assembled full-boat DAC 2.6 performs at such a high level that in spite of the wishes, it is so good that it is not left in the dust by more expensive DACs. The last thing on the wish list would be auto input switching to the active digital input like many DACs do these days, even inexpensive ones. The fully upgraded DAC 2.6 has uncolored sound, a moderate price, and very good to excellent performance in every sonic parameter. These will make it easy to live with over the long haul. While the Assemblage upgrade kits raise the price of the DAC 2.6 by $259 (kit prices), the results transform the stock performance from solid but unsatisfying to true high-end worthy sound quality. Prices: Assemblage DAC 2.6 kit $699, assembled $749; Turbo op-amp kit, $50; 1704 24/96 filter kit, $50; Signature parts kit $159, installed $209.